Charles Bakolo launched a One Student One Tree Campaign in memory of his parents. 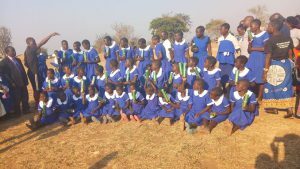 The campaign was launched on 28th September 2018 at one of the Anglican Church primary schools in the Central Region of Malawi as part of the Green Anglican activities on Creation Care. More than 22 trees (both fruit and non-fruit) were planted during this event. The activity was organised to award the best performing girls at this school. 42 girls Uniforms and school writing materials were distributed to 42 outstanding girls from Standard 1 to Standard 8. Charles Bakolo Mvula planted a tree to mark the launch of the Campaign where Chiefs and School Authorities were in attendance. In addition 40 outstanding boys at the schools received writing materials as a way of motivating them to work hard in class. There will be a similar activity at Chalundu Primary School in the same District when funds will be available.